Newspaper with Art Gangster stamp (left); detail of stamp (right, top); envelope addressed to Artforum offices (right, bottom). For several years, Gallery 98 has been puzzled by a piece of mail art in our inventory, originally sent to the offices of Artforum in 1974. The piece consists of the front page of the Los Angeles Times of February 28, 1974, with a lead story on artist (and later gallerist) Tony Shafrazi’s vandalism of Pablo Picasso’s painting “Guernica” at the Museum of Modern Art. 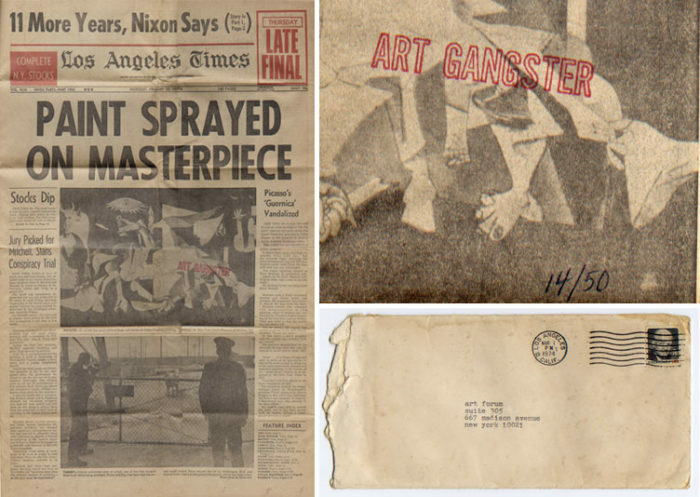 On top of the original newsprint, the artist has rubber-stamped the phrase “Art Gangster” and handwritten the numbering “14/50,” in effect making it a fine-art edition. Now, thanks to the research of curator Greg Ellis (whose exhibition “Screaming in the Streets: AIDS, Art, Activism” is on view at Clamp Art through September 23), the Art Gangster has been revealed as artist Jerry Dreva. A provocateur among other mail-art practitioners like General Idea, On Kawara, and Ray Johnson, Dreva lived between Los Angeles and his native Milwaukee until his death, at age 52, in 1997. In the late ’70s, Dreva used the “Art Gangster” tag for surreptitious works of graffiti, which he slyly promoted in his day job writing for the South Milwaukee Voice-Journal (without revealing his hand in the work). A photograph of Dreva holding the L.A. Times issue with the “Guernica” headline would seem conclusively to solve the mystery. High Performance‘s 1980 feature on Dreva from has been digitized at East of Borneo. Marc H. Miller’s East Village Eye account of Tony Shafrazi’s notorious performance is online at 98 Bowery. Jerry Dreva holding the Los Angeles Times of February 28, 1974. From a contact sheet reproduced in High Performance #9, 1980.